Who was Constantine, and why is he important to the history of Christianity? When did the Christianity started integrating with the civil life of the Empires? Flavius Valerius Aurelius Constantinus (280 – 337 AD), commonly known as Constantine I, (among Roman Catholics) and Constantine the Great, or Saint Constantine (among Eastern Orthodox and Byzantine Catholics Christians), was an Illyrian Roman Emperor, proclaimed Augustus by his troops in 306, who ruled an ever-growing portion of the Roman Empire until his death. Best known for being the first Christian Roman Emperor, the Edict of Milan - issued by his co-emperor Licinius - helped to put an end to institutionalized persecution of Christians in the Empire. Undoubtedly, the role of the Roman Emperor, Constantine is pivotal, if not - crucial, in the history of world Christianity as the understanding and conception of the religion and even God Himself transformed and underwent modification after the reforms that took place at the time of his reign. During several centuries, Christians all over the world have been experiencing an impact of the religious reformation that expresses itself, to the present days, in the way the liturgies are conducted in the churches; in the way the majority of Christians confess and even form and conceive their faith declining the correctness of other concepts of God and faith in Him; in the acceptance and/or rejecting authoritative writings believing that some of them ‘were sent by God’ and others weren’t; in the structure and organization of Christian communities; in interaction between “insiders” and “outsiders” and in general religious influence on the society, and its role in people’s lives, assuming, again, that all this is a result of divine interference and, by no means, with human participation. Partly, it is caused by the lack of knowledge and unwillingness to obtain it preferring someone to decide for others what and how to do something and another partial cause is in the convenience of the formed during centuries habitual way of conducting our religious lives, realizing the necessity of transformation but fearing, at the same time, that the changes may be achieved only by radical revolution within the world Christian movement and understanding of it, fraught with serious consequences for the society in general and each individual in particular. For me, personally, as for the majority of historians, the figure of Constantine is very controversial. I would refer myself to the group of so-called skeptics as I first of all, understand Constantine as a very skillful politician and tactician. Looking at the social situation that was formed by the time of Constantine’s reign, by the end of the III century, I would say, that he, as a smart tactician, HAD TO embrace and legalize rapidly growing in numbers religious movement. First of all, after a few waves of persecution and martyrdom that followed it, Christianity as a religion attracted more and more new converts as the acts of martyrdom signified a great courage that, in turn, indicated worthiness of what martyrs were dying for (it cost people a life, after all); the martyrdom caused the development of a very strong tradition that was based on and inspired by the lives and agonies of martyrs; that also means that the persecution, obviously, is not the right way to eradicate the religion as it causes more appreciation for the religion and new waves of conversion. Second reason, was weakening of the former system or order of gods under the pressure of other rising religions – Manichaeism, Mithraism and Christianity; it had to be reconsidered, as well. Thirdly, “following each wave of persecution through the third century, membership roles in the churches took a dramatic leap forward [when] educated members of the Roman upper classes, especially women, were becoming Christians in greater numbers, bringing with them their wealth and a new attitude of social respectability.” Unquestionably, the upper wealthy class is the ruling class; their involving into the ranks of Christianity and accepting the views and ideas of the new stream that go against the imperial politics may easily cause the loss of emperor’s authority and power. Fourthly, and to me, more importantly, by the end of the III century, Christianity formed well organized hierarchical system with established set of moral principles, disciplinary practices and authoritative liability that, in turn, became a projection of established and easily controlled society where, basically, people were controlling themselves… with joy. 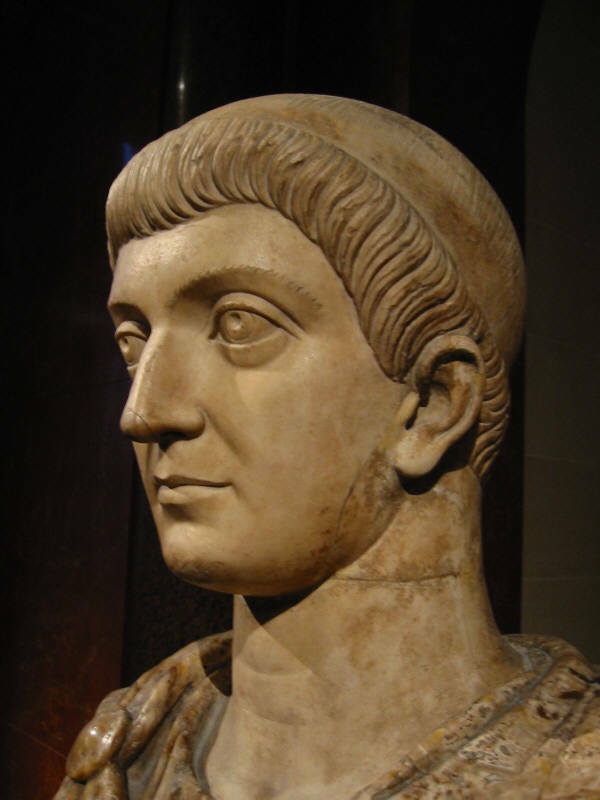 Thus, under these circumstances, Constantine had to establish his own, imperial and military authority among powerful religious movement by integrating it with the imperial civil order but, understandably, explaining the process and necessity of integration using religious and/or symbolic tools by making or, might be, experiencing the following event when “… the victorious emperor himself long afterwards declared it to the writer of this history, when he was honored with his acquaintance and society, and confirmed his statement by an oath, who could hesitate to accredit the relation, especially since the testimony of after-time has established its truth? He said that about noon, when the day was already beginning to decline, he saw with his own eyes the trophy of a cross of light in the heavens, above the sun, and bearing the inscription CONQUER BY THIS”. On the one hand, the emperor declared vision himself, which, rationally speaking, very doubtful could have happened. On the other hand, in a kind of religion where the theme of the irrational mystical work of the Spirit and personal spiritual experience are central, this sort of spiritual experience would make sense for believers and would also be attractive. Thus, Constantine not only integrates Christianity into the civil life and legalizes the religion but also elevates clergy, who by that time obtained a great deal of authority, to the status of state officials and attempts to create a mechanism for paying all of Catholic clergy out of the state treasury; we find some interesting reasons for doing so in the edict that he sent to Anulinus to North Africa: “Greetings to thee, our most esteemed Anulinus. Since it appears from many circumstances that when that religion is despised, in which is preserved the chief reverence for the most holy celestial Power, great dangers are brought upon public affairs; but that when legally adopted and observed it affords the most signal prosperity to the Roman name and remarkable felicity to all the affairs of men, through the divine beneficence,—it has seemed good to me, most esteemed Anulinus, that those men who give their services with due sanctity and with constant observance of this law, to the worship of the divine religion, should receive recompense for their labors. Wherefore …the head of the church of that entire section of country who give their services to this holy religion, and who are commonly called clergymen, be entirely exempted from all public duties, that they may not by any error or sacrilegious negligence be drawn away from the service due to the Deity, but may devote themselves without any hindrance to their own law. For it seems that when they show greatest reverence to the Deity, the greatest benefits accrue to the state…” Here, as I mentioned before, he proves himself as a skillful tactician granting the religious clergy certain privileges that, unquestionably, very hard to reject making it a part of the state. Some time later, the emperor resolves the conflict on the proper definition of the nature of Christ as the second person of the Trinity by bringing together the Council of Nicaea and establishing the final version of the confession of the faith for the sake of religious and, by that time social, unity of the state. Thus, he did everything he could and, he did it perfectly, in order to establish a new kind of society that by the time of his reign was impossible to separate from rapidly growing religion; the best way to control people, and this is obviously what any ruler would want, is legalize and make official something that they hold dear and organize the society in general by institutionalizing, systematizing and bringing it to the order and peace for the ruling and controlling convenience. As always, as in anything else, there are positive and negative sides of Constantine’s achievements. For me, personally, religious and/or spiritual experience is about individual that follows by developing and strengthening self-control and self-discipline by, what might seem pretty conservative and radical, abstaining from worldly lifestyle and freeing oneself from one’s own passions. By becoming a state religion and by getting fully integrated with the civil life, Christian identity began to require less effort when the boundaries between law of God and law of people or human authorities were not clear. When the church clergymen who once were equal to their flock and were supposed to teach, help and guide, obtain a civil power, they start establishing the rules that very often are not in the accordance with the message of love. The religion becomes a matter of prestige and division in the society but not a matter of unity and seeking eternal truth; self-discipline and self-control no longer matter and religion that was supposed to bring us closer to God and self-understanding becomes exclusive and egoistic way of socializing. We, unfortunately, realizing this fact, prefer to be ignorant and follow the crowd in order not to end up at the margins of the society; this is exactly, what was established over a thousand years ago and it is indisputably, more comfortable for the majority.